Tucson, AZ, February 23, 2018 ― Economic inequality, racism and classism—among many other societal ills—loom large in the United States and around the world. The need for change has never been greater. So where do we begin? Mass marches and demonstrations have short-term impact. The world needs a guide toward lasting change, and Dr. John Jensen has delivered it with We Need a Movement: Four Problems to Solve to Restore Rational Government. This provocative new book reveals four principles of group activity that can turn interest into sustained commitment. 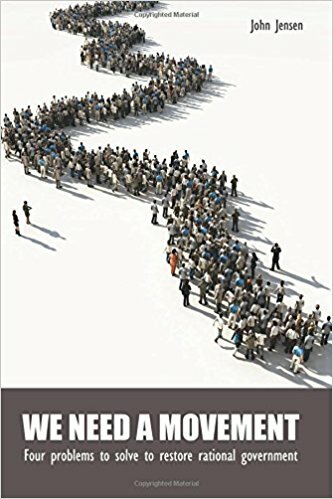 We Need a Movement outlines the steps necessary for leading others toward dedication to a common goal, how a vision of achieving change gives people confidence, how simple actions spur their interest in participating, and how learning together fuels both the message to society and the bonds people develop. In short, readers will learn how to start a movement, organize a group, and effectively motivate people for a common goal. Additionally, Dr. Jensen retraces the common steps of 26 failed civilizations to drive home his message that the United States needs leaders committed to rationality, evidence, comprehensive values, the good of the whole, and the care of those left behind. The need for change is real and urgent. Our country needs credible, determined people to apply good solutions to problems at every level. We Need a Movement: Four Problems to Solve to Restore Rational Government can help guide the way. Author John Jensen is a former Catholic priest, a clinical psychologist, and an educational consultant who has worked extensively with groups in efforts for social change. In We Need a Movement, Dr. Jensen mines a rich field of individual and group psychology to explain key guidelines for generating a successful movement. He vividly presents critical factors of communication and conflict resolution seldom translated from the professional arena into layman’s use. For more on the message of Dr. Jensen’s book and a complimentary download of it, please visit: www.movementwithoutgunfire.com. PreviousHow to Become a Successful Blogger?